With the click of a button, Vivien Coulson-Thomas removes the cadaver's skin. Another click and she removes muscle to reveal her target – blood vessels. All the while the assistant professor of optometry marvels at the one-touch dissection process. "You can control the table to have whatever you touch disappear to reveal the structures of interest," she said. That's pretty much how the 3D Anatomage Table works. It uses digital cadavers to help teach anatomy, and the University of Houston College of Optometry is the first optometry school in the nation to have its own table – and not only one, but two exclusively for students. Many systemic conditions, like hypertension and diabetes, lead to eye disease so in their training, optometry students go through rigorous anatomy courses focusing on not only systemic pathology, but also the head, neck and skull. In recent years the anatomy tables have popped up in medical and nursing schools, including one at the UH College of Nursing on the Sugar Land campus. They seem to solve so many problems. 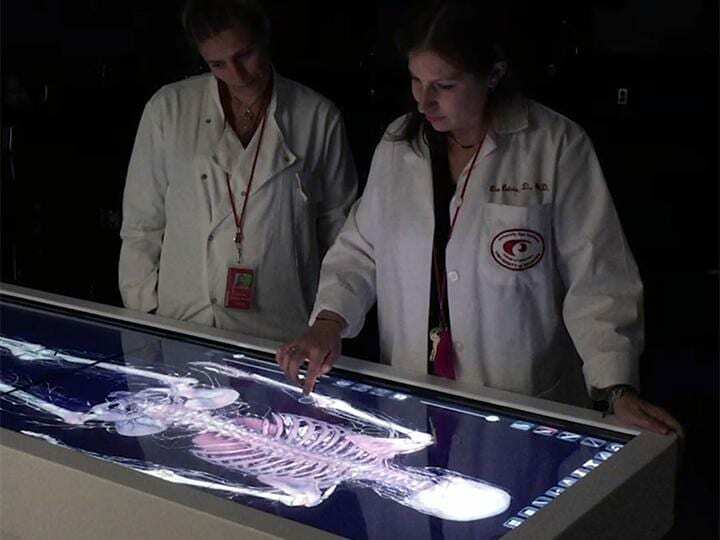 "The Anatomage Table provides an innovative, world class learning opportunity for our students. In a University as diverse as ours, this will give us the opportunity to accommodate students who, because of religious, cultural reasons or past trauma could not work with human cadavers," said UH College of Optometry dean and Greeman-Petty professor, Earl L. Smith. Then there's the practical side of dissection. With a human cadaver only so much cutting can be done, and much of the internal views are blocked. "If you want to know how the esophagus and the trachea are aligned with the vertebral column, with a cadaver you can only dissect from one side and you get a rough idea, but with the Anatomage Table you can actually isolate those three organs, turn them around to get a 3D look and literally see how these organs lie against one another," said Coulson-Thomas. "The 3D view adds a new layer to the learning process." Not meant as a substitute for human cadavers, the digital cadavers are also used as a tool during actual human cadaver prosection (dissection by the professor). Again it has to do with the line of sight. In the normal course of dissection, whether removing a vein or artery, the view of the underside is hidden. By pausing the dissection and calling up the same vein or artery on the table, the user is able to turn it around and look at in 3D. "It completely revolutionized the whole prosection process. We used the Anatomage Table to guide some of our prosections, and it made the whole process a lot easier. When we first bought the table I never thought of it being used in that way." That in-depth view is what she and assistant professor of optometry Lisa Ostrin, were looking for when they took over the anatomy course in the fall. "If I had one of these tables when I was taking anatomy, it would have been incredible, and Dr. Ostrin and I wanted to bring that experience to our students," she said. The pair spearheaded the seemingly overnight effort, and the tables arrived in time for the semester to begin and their own software tutorials to take place. Having the extra table, available to students in off hours, means they can study the digital cadavers for their boards and other important tests on their own schedules. "It's really 21st century teaching and learning," said Coulson-Thomas. Partial funding from the S. R. Marco Family Foundation allowed UHCO to purchase the two Anatomage Tables.